As lymphoedema practitioners a large proportion of our time is spent educating our clients. One aspect is providing information on how to reduce the risk of lymphoedema occurring in those at risk and for those with lymphoedema ways to reduce their lymphoedema or prevent exacerbation. When I first starting working in this area in 1991 advice was always focused on what the individual “Shouldn’t do” or the “the don’ts”. I remember one hospital educating their clients after axillary lymph node removal to not lift anything more than 8 dinner plates! 27 years on a great deal has changed. This research had 632 subjects. The design included bilateral arm volume measurements by the optoelectronic Perometer. All patients had a preoperative baseline measurement, a postoperative measurement, a measurement after chemotherapy and/or radiotherapy, and measurements at regular follow-up intervals corresponding with oncology visits. Regular follow-up intervals correspond to time periods of between 3 and 7months. At each measure the patient completed a survey on which they reported the number of blood draws, injections, blood pressure readings, and trauma to the at-risk arm(s); number of ﬂights and the length of the ﬂight since their last measurement; and use of compression sleeve while ﬂying. Self-reported trauma ranged from bruising to arm fractures. In the ALND group there were 159 and 34 went on to develop lymphoedema. In a subset of patients that underwent ALND, BMI and cellulitis remained signiﬁcant, but blood draws, injections, blood pressures, trauma, and air travel, and three or more ﬂights, or duration of ﬂights (1 to 12 hours) and 12 hours or more v none were not associated with increased arm swelling. One should perhaps question the sample size of ALND v SLNB. The authors concluded that there was no signiﬁcant association found between undergoing ipsilateral blood draws, injections, and blood pressure read. The author states “Although we cannot afﬁrmatively state that risk-reduction practices have no effect on arm swelling, we hope to generate evidence that brings reasonable doubt to burdensome guidelines and encourage further investigation into non precautionary behaviors and the risk of lymphedema.” They also stated that the current risk reduction practices are not based on evidence based data. The authors did list the limitations to their study which included a relatively short median follow-up time of 24 months, low incidence of risk events, potential for recall bias, and lack of information about patients’ receipt of physical therapy. The authors could have also included the fact that they only had one form of objective measurement and considering that ALND is the highest risk group it had a smaller number of participants compared with the SLNB group. Following this publication the following article was published. This was part of the the Oncology Grand Rounds series which is designed to place original reports published in the Journal into clinical context. A case presentation is followed by a description of diagnostic and management challenges, a review of the relevant literature, and a summary of the authors’ suggested management approaches. The goal of this series is to help readers better understand how to apply the results of key studies, including those published in Journal of Clinical Oncology, to patients seen in their own clinical practice. A 46-year-old premenopausal woman with a body mass index of 21 was found on screening mammography to have a new, approximately 1-cm spiculated mass with associated calciﬁcations in the upper outer quadrant of the left breast. Stereotactic core biopsy showed a focus of invasive duct carcinoma, strongly positive for estrogen and progesterone receptors and negative for human epidermal growth factor receptor 2, with associated ductal carcinoma in situ. Clinical examination revealed no palpable mass or axillary lymphadenopathy. She underwent a left lumpectomy with seed localization and sentinel lymphnode biopsy. Final pathology revealed an 8-mm well-differentiated invasive carcinoma without lymphovascular invasion and intermediate grade ductal carcinoma in situ. The margins were clear, and three sentinel lymph nodes were negative for metastasis. The 21-gene recurrence score was 10, suggesting a 7% risk of 10-year distant recurrence with adjuvant endocrine treatment. After the completion of adjuvant radiotherapy (42.50 Gy in 16 fractions to the breast), the patient has returned for a follow-up visit. She is a professional violinist and would like to know what she can do to prevent lymphedema on her upcoming ﬂight to Vienna. This article has grabbed onto the results of the article by Ferguson et al and interpreted the results to be strong evidence for abandoning current risk reduction recommendations. They state “most current evidence points towards no beneﬁt of avoiding these behaviors and that the exact pathophysiology of lymphedema after axillary surgery is unknown.” This article has been read by many in the medical profession and together with the article by Ferguson it has led to some medical practitioners recommending that there is no need to worry about risk factors. An example of this is a presentation at the Australasian Lymphology Association symposium in 2017 when a well know Victorian oncologist suggested the same. In light of these publications some hospitals are reviewing whether they need to avoid the at risk limb for various procedures and clients are now questioning and doubting what their lymphoedema practitioners are recommending. This has led to some clients being confused and sometimes distressed that they are getting conflicting information. Debunking Lymphedema Risk-Reduction Behaviors: Risky Conclusions. Lymphatic Research and Biology, Volume: 14 Issue 3: September 1, 2016. Nudelman was concerned that healthcare professionals that only read the summary of Fergusons paper or the article by Ahn and Port and then followed their recommendations may put their clients at risk. After reading this current research together with her knowledge of the disease and current literature she felt that these sweeping conclusions couldn’t be made. Diagnosis of lymphoedema cannot be made by perometry alone. The perometer doesn’t measure the hand and chest and it can’t measure subclinical lymphoedema. Lymphoedema isn’t a static disease and those women with ﬂuctuating swelling and swelling in the hands, trunks, or breasts will be missed by the perometer. The greatest yield in diagnosis comes from careful observation, surveys, and volume measurement. Nudelman believed that the survey recall bias was inherent in the study. Most patients had avoided trauma to the arm, so only 2.1% had an injection, only 8.5% a blood draw, which brings doubt to concluding that precautionary practices can be abandoned. The editorial, by Ahn and Port, dismissed surveys as subjective, yet Armer et al. and others have found surveys to be both validated and highly correlated with BCRL. Nudelman disagrees with the comment by Ahn and Port that research by Ferguson was ‘‘rigorous, prospective trial,’’ rather an observational trial with a questionable value of 10% increase in volume as an indication of lymphoedema. Even though a large number of women were followed, very few recalled having experienced ‘‘risky’’ behaviour in their arms. The editorial by Ahn and Port concluded that only obesity and cellulitis cause BCRL, and the current risk-reduction behaviours are never warranted. The latter conclusion is neither supported by the literature nor by the article that was reviewed. In fact this is an over simplified conclusion as radiation, genetic predisposition, surgical technique, and biomarkers have all been shown to be risk factors in developing lymphoedema. Nudelman believed that unfortunately that clinicians reading the editorial will conclude that they can safely put on an automated B.P cuff and perform IM and IV injections, and tell women that their concerns are meritless and may be putting their clients in harms way. She believes that the risk factors by these articles have been over simplified and that individual risk factors must be taken into consideration. Precautionary Behaviors and Breast Cancer-Related Lymphedema. Brunelle C1, Swaroop M2, Asdourian, Skolny, Sayegh, Taghian. Lymphat Res Biol. 2017 Sep;15(3):292-294. Their hope as lymphedema clinicians and researchers is that through discussion with their peers, they can establish a thoughtful dialogue regarding clinical practice patterns with regard to precautionary recommendations for BCRL. They agree that the focus of this topic should not be on debunking the myths of such precautions but on carrying out rigorous research that may better elucidate the effectiveness of these guidelines. It is their opinion that patients expect and deserve health professionals who make recommendations based on scientiﬁc evidence. Their group has spent much time and effort over the past 10 years researching risk factors for the development of BCRL, and as such they have identiﬁed and published several, including ALND, BMI >30 at the time of diagnosis, regional lymph node radiation, oedema of 3%–5% within 3 months of surgery, and between 5% and 10% at any time postoperatively. They educate their patients about their individual risk for BCRL. They tell them there is much they do not know from the literature with regard to precautionary behaviours, but they do know which patients are at high risk. Their intention was not to draw sweeping conclusions with the goal of dismissing all precautions and changing clinical practice without further consideration and detailed research, but to suggest that it is time to add to the research base to ensure that any guidelines we give to patients are well substantiated. They are not advocating for a no-risk position among all patients with no consideration of their pre-existing risk factors, and they certainly do not suggest that practitioners use the at-risk limb for any or all medical procedures. What they hope for is a re-evaluation of current guidelines pending further research and careful dialogue. There is a lack high-level clinical trials that support or refute the application of risk reduction practices. Nudelman chose to respond to this letter and made some interesting comments. Lymphoedema can exist without an increase in the volume and close inspection of the arm is essential. Lymphedema is a complex disease, not simply swelling. Risk factors have varied due to variations in research methods. There is good evidence that women with genetic predisposition for primary lymphoedema are at extremely high risk for developing BCRL. It is essential that lymphoedema risk reduction behaviours should be considered as patient education and shared decision making. A more balanced article was published, in the Canadian Lymphedema Framework Pathways publication, by some of the authors of the Ferguson et al paper. They found that out of a total of 964 women 27.6% had at least one cycle of chemotherapy in the affected upper limb. The chemotherapy infusion in the affected limb increased the risk of lymphoedema occurring by 1.83- 1.45 times in univariate and multivariate analyses respectively. There were issues with objective measures as a diagnosis of lymphoedema was made via circumference measurements alone. There is a need for research that uses a variety of objective measurements. Incidence and risk factors of lymphedema after breast cancer treatment: 10 years of follow up. Purpose: To evaluate the incidence and risk factors of lymphedema 10 years after surgical treatment for breast cancer. Methods: Prospective observational hospital-based cohort of women undergoing axillary lymph node dissection. Lymphedema was assessed by indirect volume, measured by circumference, and diagnosed if there was a difference of 200 mL between the arms or if the patient was treated for it. Independent variables were patient, tumour and treatment characteristics. Descriptive statistics were conducted as survival analysis using the Kaplan-Meier estimate. Cox regression was performed, considering a 95% confidence interval (95%CI). Results: The study evaluated 964 women. The cumulative incidence of lymphedema observed was 13.5% at two years of follow-up, 30.2% at five years and 41.1% at 10 years. Final model showed an increased risk for lymphedema among women that underwent radiotherapy (HR ¼ 2.19; 95%CI 1.63e2.94), were obese (HR ¼ 1.52; 95%CI 1.20e1.92), had seroma formation after surgery (HR ¼ 1.46; 95%CI 1.14e1.87), underwent chemotherapy infusion in the affected limb (HR ¼ 1.45; 95%CI 1.12e1.87) or advanced disease staging (HR ¼ 1.41; 95%CI 1.11e1.80). Inform clients that there is a lack of research evidence regarding risk factors for developing lymphoedema but that doesn’t mean that we throw out the current information but rather we need to look at individual risk. This may be influenced by their genetic predisposition, BC treatment related factors cancer (ie ALND vs SLNB, RT to axilla, chemotherapy), obesity etc. It is essential assess a client via a number of objective measures rather than volume alone. Surveillance programs with multiple objective measurements including the obvious observation, palpation, the use of such tools as bioimpedance spectroscopy and measuring the tissue dielectric constant ( eg with the MoistureMeter or Lymphscanner) may assist the practitioners and their clients to evaluate their risk of developing lymphoedema and the activities that may be considered a risk for them. One shoe doesn’t fit all and what advice we provide for someone who has had SLNB will differ to someone that has had ALND. 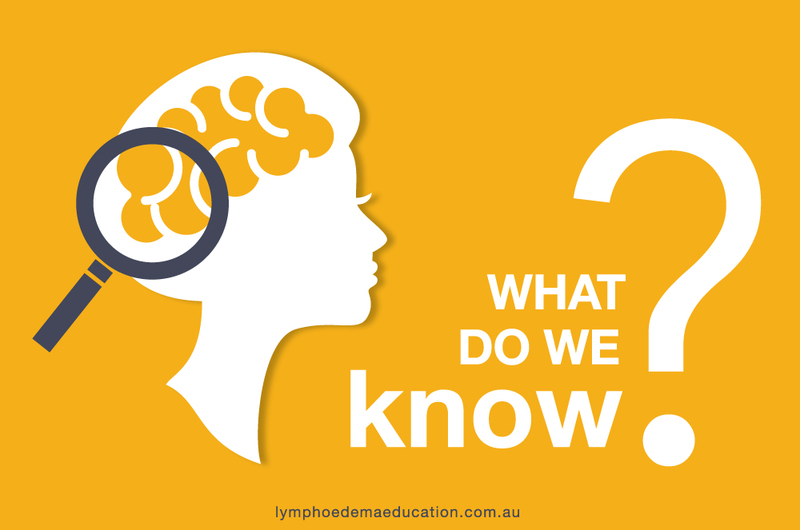 Education for someone at risk differs for someone that already has established lymphoedema. It is essential for those with lymphoedema are aware that some behaviours may aggravate their oedema and should know how to evaluate this and also be able to modify such behaviours.